I dropped by Pizza Port in Carlsbad, California this week to conduct a little impromptu field research with award-winning master brewer Jeff Bagby. The mission: compare Indie Hops’ type 90 pellets with that of the competition. As reported, we’ve designed a state of the art pellet mill that’s sized and scaled to meet the needs of craft brewers. We’ve increased the average particle size of the grist and lowered the temperature at the pellet die in order to minimize damage to the lupulin glans, home of the rich and aromatic hop oils. We designed the mill with the goal of converting the form of the noble flower without excessively oxidizing the oils. At the 2009 GABF, Jeff won an amazing seven medals and Pizza Port Carlsbad was awarded the Large Brewpub and Large Brewpub Brewer of the Year. Not only does Jeff have the accolades, he’s also an incredibly polite, humble and decent guy who clearly loves his work. Despite being pulled in about 12 different directions on a typically helter skelter brewing day, Jeff was kind enough to help me conduct a “field experiment” of sorts. I brought with me ice cold samples of our 2009 harvest, Oregon-grown Centennial an d Liberty pellets. From Pizza Port’s cold storage, Jeff scooped up a jarful of pellets from the same harvest and variety, both from another supplier. The first noticeable difference was the diameter of the respective pellets. Our pellet diameter was ¼ inch; the other’s was 1/8. When we opted for a bigger diameter, our theory was that the less grist exposed to heat during pelleting, the less oxidation of volatile oils. As we’ve come to learn, the bigger the better. Jeff broke up the pellets. IH’s pellet, he noticed, had a gummier, oilier feel and did not deconstruct into a fine powder. After concentrated finger work, the pellet broke up into small clumps. The other pellet was a tad harder, and the grind was far finer. Jeff then weighed out equal amounts of the respective hops and dumped them into pints of hot water. Both broke apart and dispersed at about the same rate. The IH pellets seemed to be more buoyant. They behaved, as Jeff observed, more like leafs from a flower, suspending longer and floating at the top. After a few minutes of settling, the other hop appeared to increase its density at the bottom of the pint a little more rapidly. The density of the hop-shake was substantially different. IH’s pellets blossomed into a thicker solution that resembled a creamy-clumpy milkshake. You could literally float a quarter on top of the IH “shake.” The other’s hop solution was thinner. Finally, the aroma. First, a disclosure. Jeff has been a brewer for over 10 years and he has been using The Other Guy’s Centennial pellets for at least that long. He is accustomed its aroma and uses their pellets in his award-winning Shark Bite, a hopped up IPA which is the beer I usually order when I bring my family to Pizza Port up the road in San Clemente. The point: Jeff is both accustomed to this hop and obviously satisfied with it. Now then. Jeff noted that The Other Guy’s Centennial hop brew exuded a “sharp, skunkier, marijuana aroma.” The IH pellet, brew by comparison, had a “more herbal, spicy, peppery” aroma. Pizza Port’s supplier of the hop in question was from Washington, but we don’t know where the hops were grown. Nor do we know exactly who pelleted said hops. The IH hops were grown on Goschie Farms in the Willamette Valley, Oregon. They were pelleted about 2 months ago at our new “patient” pelleting mill in Hubbard, Oregon, located only a few miles up the road from Goschie Farms. Thanks Jeff, we appreciate your candid feedback. Throughout the session, I nursed a pint of Sharkbite, which featured the Other Guy’s hops. I loved it. It’s hard to imagine improving an already delightful taste, but like my partner Jim says, “The day you stop getting better is the day you start getting worse.” At Indie Hops, we aim to get it right. Brewer feedback is not only essential, it’s fun. It’s even more fun when it validates our theories about the linkage between pellet particle size, pellet surface area to volume , and pellet die temperature. As another well respected brewer in nearby San Marcos, Tomme Arthur of Lost Abbey, recently suggested to me: if less oxidation is the Holy Grail, why not process cigar sized or even hockey puck sized pellets? Good question. We’re on it! Hood River, Or. 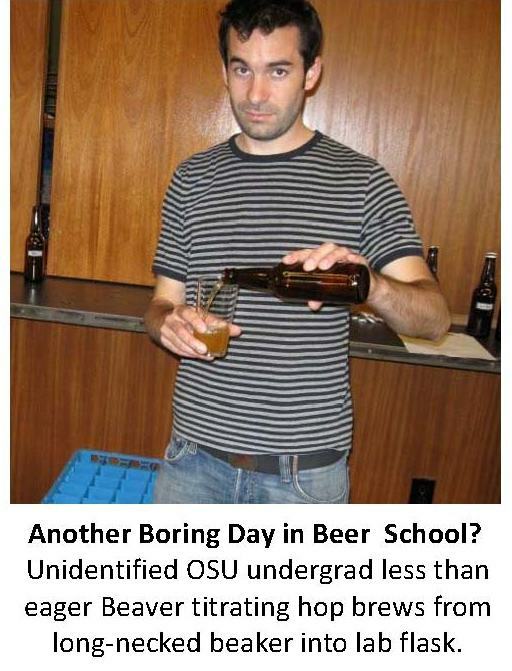 Oregon State's Hop Docs wanted feedback from Pacific Northwest brewers on building a new aroma hop and it sounds like they got an earful. The consensus? Dial down the alpha, jack up the oils, and add something "tropical" to our flavor arsenal beyond the all-pervasive citrus bomb. Create a sensory neutral environment . Present an experienced panel with six (6) single hop brews, plus a series of dry hopped brews. Ask each to fill out a confidential form that best describes the primary hop aroma (viz., floral, fruity, tropical, spicy) and flavor (viz., cirtrus, herbal, grassy, woody, sulfury, cheesy). For each rubric, the panel was asked to further define secondary descriptors, for example, my personal favorites: rose, apricot, mango, anise, sagebrush and not-so-favorites like sweaty, garlicky, leathery and rabbit urine-ish. And, finally, after each pair of test brews, open up the panel to a robust but sincere discussion. The hop sensory panel is the first step in a novel two-part strategy designed by OSU professors Tom Shellhammer (the fermenter/hop chemist) and Shaun Townsend (the geneticist/breeder) in their science-driven quest to breed new aroma hops. Tom and Shaun have been collaborating since January 2010 in their noble mission, pursuant to a $1 million grant from Indie Hops. The panel was convened in conjunction with the annual meeting of the Pacific Division of the Master Brewers Association (MBAA). 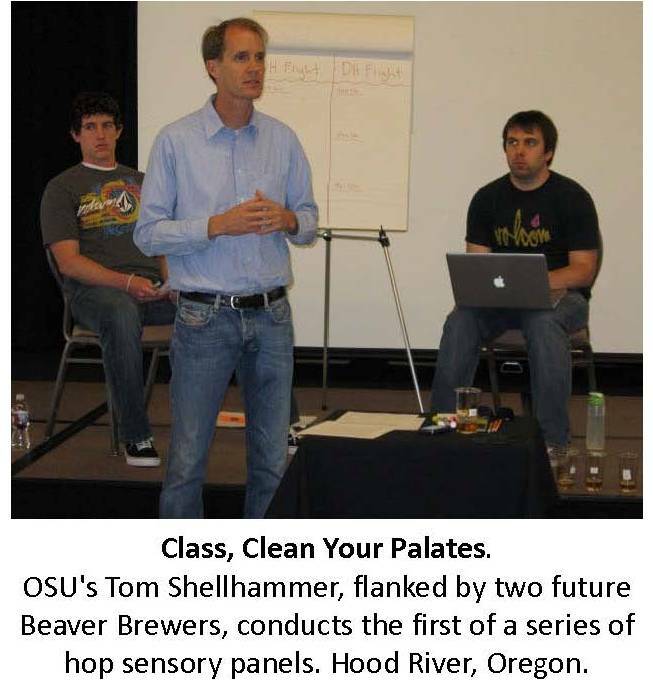 The sensory panels using trained brewers, explained Dr. Shellhammer, is critical in providing clear guidance to Dr. Townsend, who will be selecting hop candidates for crosses in the hope of amplifying known or new desirable characteristics. "We're looking for consensus," said an optimistic Dr. Townsend, whose mind seemed to be spinning with ideas after the panel. 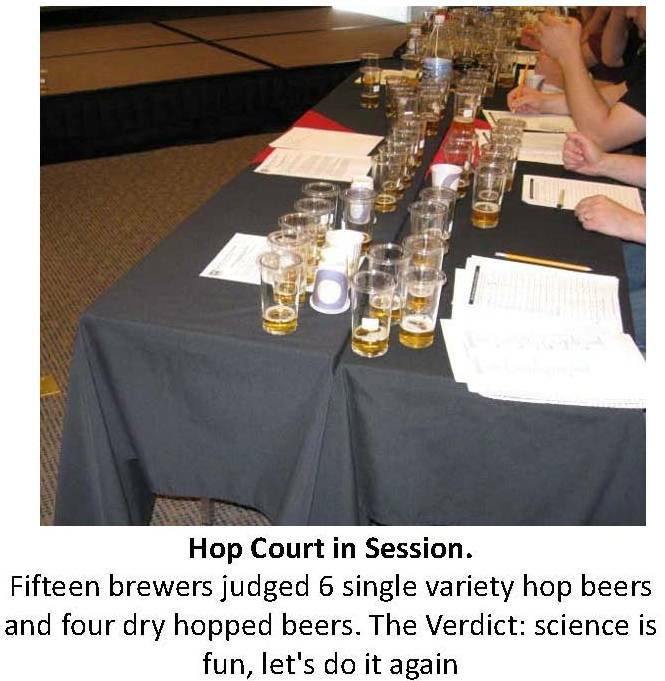 "Early in the breeding process, breeders generally work with little feedback from brewers and chemists. This is an important first step in selecting genotypes that can lead to new cultivars that express the profile sought by brewers. Having the end-product users involved at the front end of the breeding process eliminates a lot of the guesswork and gives me a clear set of goals." Dr. Shellhammer was equally pleased. "The brewers were excited about being asked to participate in the process. Their candid and honest evaluations will help us narrow down the target characteristics. In the end, we're looking to develop alternatives to the current menu of commercially available hops that will endure the test of time." The next step is for Dr. Shellhammer to analyze the data for patterns. Over the next few years, Dr. Shellhammer will be conducting at least six sensory panels. He is in early discussions with the San Diego Brewers Guild to hold a second hop sensory panel in early November of 2010. Several of the brewer panelists agreed that the research effort was both valuable and long overdue. One brewer told me that it was "just nice to be included. 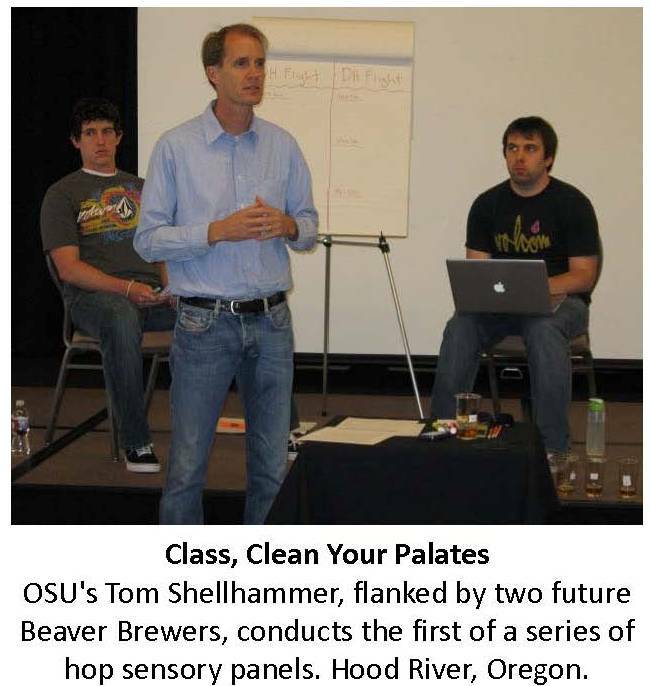 Instead of a few brewers pursuing their own agenda behind a veil of secrecy, it was great for OSU to open up the discussion among a diverse group of brewers. In the end, everyone benefits from innovation." To preserve the objectivity of the effort, and to avoid any hasty conclusions, OSU is keeping confidential the identity of the hop cultivars that were evaluated by the panel. Another area of research of keen interest to the brewers was the optimal harvest date of aroma hops. As part of the Indie Hops grant, OSU will be conducting a pilot study on the correlation between harvest date and oil content in fresh cones. The brewers did not venture to say which specific oils they were interested in seeing more of. For now, their uncomplicated message is less alpha, more total oils. The panel also raised the concern that the craving for super alphas has led to a proliferation of harshly bitter concoctions that tend to blow up the tongue like a wet sponge. The road to new and useful cultivars is long, narrow and mostly uphill into a headwind. There are no shortcuts -- no magical bullets -- although advances in molecular marker mapping could one day speed up the process of selecting desirable traits (such as disease resistance, crop yield, and, since we're dreaming here, guava-mango aroma). As Dr. Townsend explains, "There's a reason that Fuggles, Saaz, East Kent Golding, and similar ancestral varieties selected before 1900 are still used today: hop aroma and flavor is an exceedingly complex beast and very difficult to select for." Every paradigm shift, every great revolution, has to start somewhere. The prize starts with a vision. The sensory panels will help bring the prize into focus. Amping up oils (after first determining which of the 200 plus hop oils are useful) presents challenges that are orders of magnitude greater than the shade tree mechanic task of boosting the alpha juice. Put simply, when it comes to tinkering with aroma oils, the current state of the art is somewhere between 1st and 2nd grade. Using conventional breeding methods, we can of course get to the “promised land” in my lifetime – and we will much sooner than that. But to get there repeatedly, in addition to bucket loads of data, ample amounts of sweat and tears and gobs of good luck, to paraphrase Mr. Spicoli from Fast Times : we're going to need to develop a cool set of new tools, pronto. US Public Aroma Cultivars: Use ‘em or Lose ‘em? Why do certain crafties continue to prefer European aroma hops over the US grown surrogates? Do the land race varieties offer superior flavor and aroma? Is it true that the US grown aroma varieties were never intended to replace the nobles? Did the industrials back in the day task out the USDA to cook up substitutes just in case of a catastrophic European crop failure, or to leverage against price or supply manipulations? Did the industrials simply want substitutes for Hallertauer mf, Saazer and Tettnanger as an insurance policy in case the real McCoy weren’t available? Or, are the US public cultivars as good or better as the European originals, but some crafties insist on using select German and Czech varieties because of the mystique thing – you know, to truly appreciate beer, you have to wear lederhosen, swill from a tankard the size of a mail box, and polka to that good old oompah beat. And, finally, if the industrials no longer give a sprig about aroma hops, and crafties are caught up with the romance of German hops, and the trend stateside is towards jealously guarded proprietary hops, leaving the US aroma varieties potentially in the dust, who’s going to fill their shoes? 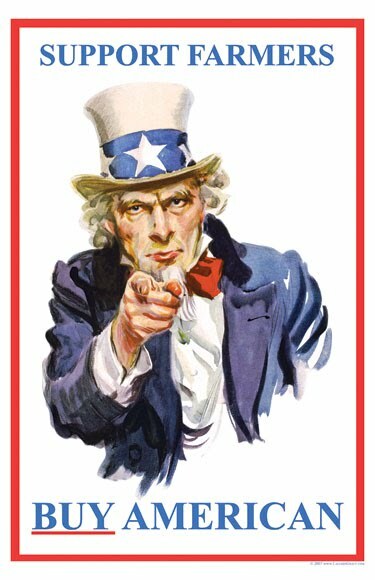 Who’s going to fill your kettle with fresh, unique and locally grown hops? Who’s going to want to follow Daddy’s footsteps and farm hops? Insurance, Default, Better or Just Different? 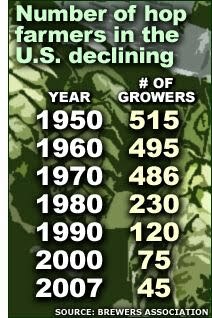 I put these big questions to the Hop Oracle, Dr. Al Haunold, inventor or co-inventor of 23 public hop cultivars during his reign as the Head Hopster for the USDA-ARS hop station in Corvallis, Oregon from 1965 to 1996. You want straight answers? You go right to the source. First, focusing on German and Czech hops, why the flurry of activity back in the day if the Industrials never really used much Liberty, Mt. Hood, Crystal, Santiam, Sterling, etc? Did AB intend to use Liberty, Mt. Hood and the others as substitutes for imported Hallertauer MF? “The Industrials always encouraged me to concentrate on aroma hops. But, looking back, I can see the disconnect. 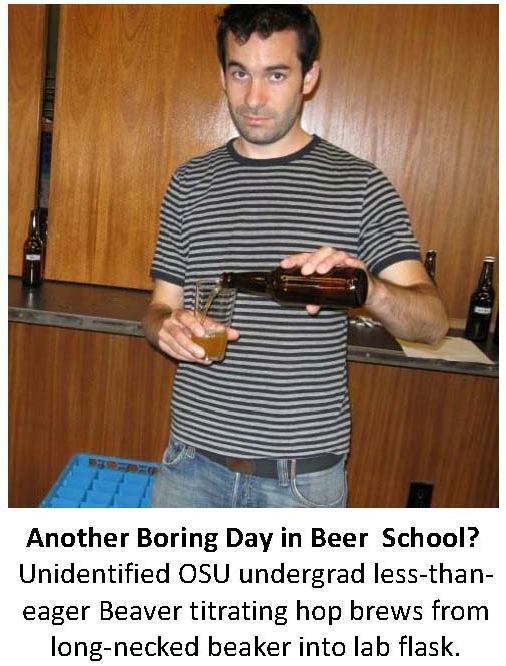 The scientists within each company sincerely appreciated what I delivered in terms of disease resistance, higher alpha, and higher crop yields, but the lab guys didn’t make the call on what wound up in the beer recipe,” mused Al. The craft brewers have kept Al’s creations alive – the roster of public cultivars, such as Liberty, Mt. Hood, Crystal, Santiam and Sterling which, for short, I’ll call the Super US Noble Aromas (SUNAs). Unlike the biggies, for whom tradition and consistency have been used as cover for refusing to innovate or take bold chances, the crafties have distinguished themselves as unbound by the shackles of rigid traditionalism. Indeed, this pilgrim has recently traveled to the UK, Belgium and France, where the buzz in the pubs (at least detected by me) was that the American crafties were leading the charge for creative, bigger and better brews. Doing More with Fewer Aromas? So where does this leave the US aroma hop? In 2008, when the supply spigot went dry and the prices skyrocketed, many US crafties put their trademark thriftiness and resilience to work, and started brewing with fewer aroma hops and more bittering hops. A few brewers I’ve spoken to offered that instead of using three aroma hops, they were forced by the shortage to use one, but the flavor and aroma didn’t suffer proportionately. Today, even though more aromas are available, they’ve decided to stick with their modified recipes that get more mileage out of their bittering hops. Do we have a perfect storm? Industrials certainly don’t want much if any of the publicly owned SUNAs. Big crafties continue to trumpet the mystique of quaffing traditional brews flavored with German grown land race hops. And the more frugal small crafties have discovered they can do more with bittering hops. In the end, price, quality and freshness matter. The freight charges from Germany (and New Zealand) can be substantial. Shipping hops in tightly packed containers for days and days in the hold of giant cargo ships can also exact nasty wear and tear on hops (think of ice cream melting in the sun). The carbon footprint is another factor weighing in favor of SUNAs. And who needs the headache of figuring out the purchasing power of the US dollar against the Euro? Finally, just as drinking a German beer can invoke a nostalgic experience, the same can be said about quaffing a rich American pale ale using all US grown ingredients. It’s refreshing to look into that frosty mug, inhale the floral aroma, taste the citrusy freshness, and know that you’re helping put a US hop farmer’s kid through college.